Every year I eagerly await the peaches brought to town from The Peach Truck. As soon as I see their signs around town I scour Pinterest for peach recipes....There are so many ways to enjoy these tasty treats...grilled and served with vanilla ice cream, sliced in a salad with red onions and mint, canned for jams and jellies, or, like I tried this weekend, as bruschetta! 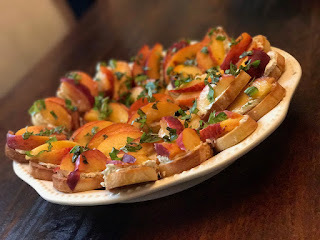 I totally forgot the honey part because I was so excited about the goat cheese and peaches so just know, if you don't have time or don't like honey, this is just as delicious without it as I am sure it is with it! Place cream cheese and goat cheese in a bowl and either warm in a microwave until just barley soft enough to combine easily with a fork. Mix with a fork until smooth. Set aside.